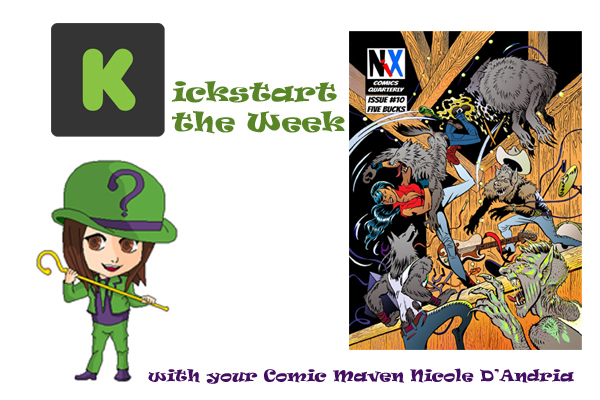 We covered the last Nix Comics Quarterly on “Kickstart the Week,” but this time we have Nix Comics entire slate for 2018, which includes five Comics, two magazines, two records and an art book! Backers will get several options for stories inspired by punk rock bands, record store and b-movies. Nix Comics Quarterly #10 is a 28 page anthology in the style of pre-code horror comics like Tales from the Crypt. The stories revolve around rock music and record store culture. 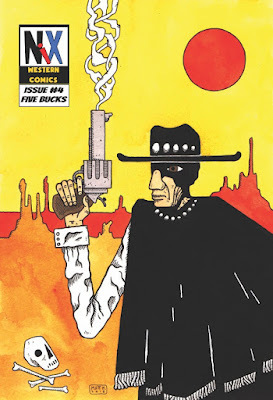 Nix Western Comics #4 is a 24 page book collecting spaghetti western themed stories about Sheriff Earl Vance and outlaw Johnny Skell, who died in the first issue. 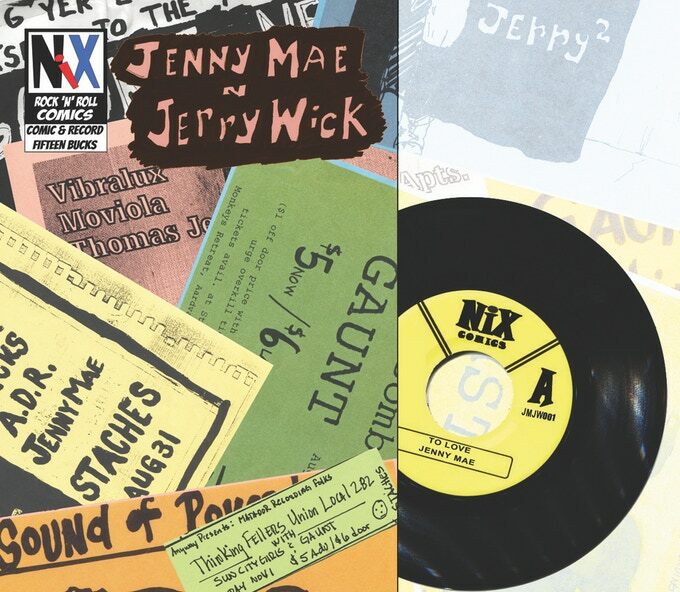 The Jenny Mae & Jerry Comic & Record Set is the third in a series of adaptations of writer Bela Koe Krompecher; it’s a 24 page black & white comic in which Bela shares his friendships with musicians Jerry Wick and Jenny Mae. 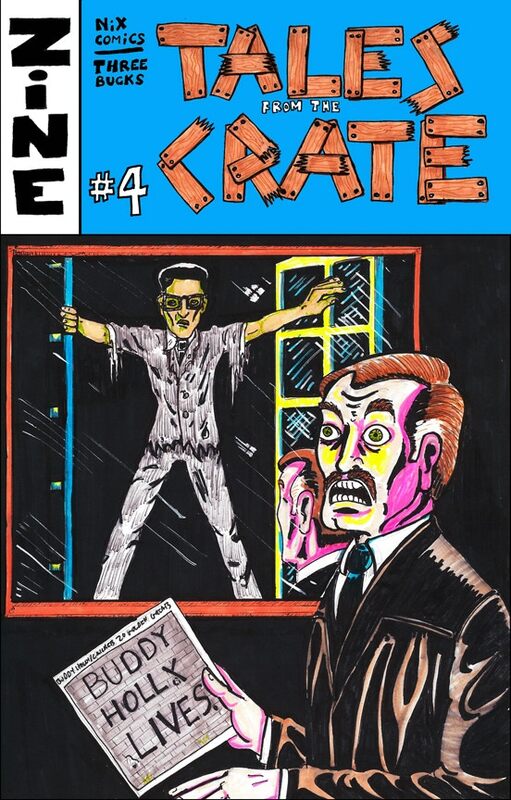 Tales from the Crate #4 is about Ken Eppstein’s bonanza of garage rock and power pop 45s that he found on his trip to Columbus's quarterly record show. And even more comics, zines and records, which you can check out on their Kickstarter page! They need to reach their $8,000 goal by April 15, 2018 at 1:38 PM EDT. Me: You mention the anthology is in the style of pre-code horror comics. What about these comics inspired you to adapt their style for Nix? Eppstein: I like the pacing and brevity of those old mags. Personally, I’m an impatient reader and feel like most modern comics are long, drawn-out affairs. I want a comic that hits me quick again and again with a bunch of stories. All killer, no filler, as they used to say! Me: How were each of the stories in the 10th Nix anthology inspired by rock music and record store culture? Eppstein: In some cases it’s real obvious… Michael Neno and I have a recurring character named the Vicar who leads a garage rock band, dresses as a priest and slays all of the monsters that he finds lurking in the seedy bars that the band plays. The character draws visually from artists like Joey Ramone and Guitar Wolf and his stories are basically a tour diary. In other cases the connection is a little more tangential… Short humorous anecdotes that people who frequent record stores share about public transit or urban legends about musicians. Also… The anthology format is actually not unlike a good record compilation…. A lot of tracks that give you an overview of a genre. 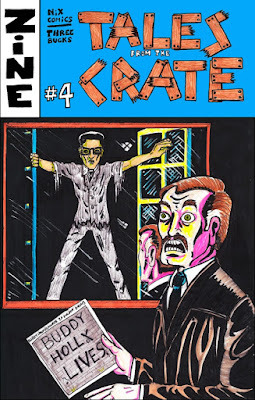 I totally see something like Tales From the Crypt as being on the same spectrum as Lenny Laye’s classic “Nuggets” garage rock compilation in that sense. Me: How has the anthology changed over time from the first to tenth issue? Have there been any changes that took you by surprise or that you expected to happen but didn't? 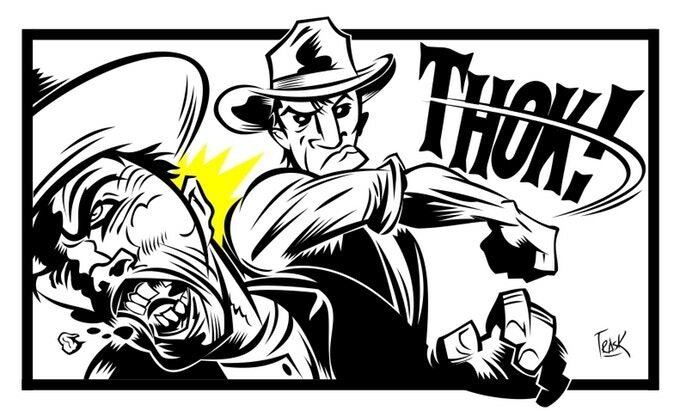 Me: You decided to make a collection of Nix comics that were westerns. Why did you decide to use this genre in particular? Eppstein: Westerns are a genre that I’ve always enjoyed. I think that westerns are a great microscope for examining American culture… Both the admirable aspirations and the exploitative, irrational and often bloody realities of our actions. A good friend of mine tells me that it’s odd how my Westerns are so much darker in tone than my horror stories, but I think it makes sense given the context of what I use the genre to illustrate. Me: What can you tell us about the two main characters, Sheriff Earl Vance and outlaw Johnny Skell? Vance is definitely based on the stalwart sheriff type like James Arness in Gunsmoke or any number of John Wayne roles, but with more flaws. I try to write Earl Vance stories from the perspective of tearing down the mythos of the superhumanly moral lawmaker that was prevalent in the “cowboy code” type westerns. Skell is definitely more inspired by the spaghetti western era of movies. Much like there was real life enmity between Clint Eastwood and John Wayne over the relatively loose morality of Eastwood’s cowboy archetype, the Johnny Skell stories revolve around Skell butting up against older, supposedly highly moral, western character archetypes. Me: What can you tell us about the music accompanying the Jenny Mae & Jerry Comic? Eppstein: Jenny Mae ‘n Jerry Wick is the last of three comics Nix will do based on my friend Bela’s blog about departed friends and a lost Columbus music scene. Jerry died several years ago in a car accident and Jenny Mae passed just this year from complications due to alcoholism. They were both local musicians of note with some degree of national acclaim on alternative/college radio stations and the circuit of bars where such acts toured through. While putting the book together, Bela and I decided it would be good to add a record for context to the story and a bonus for the people who collect both comics and records. 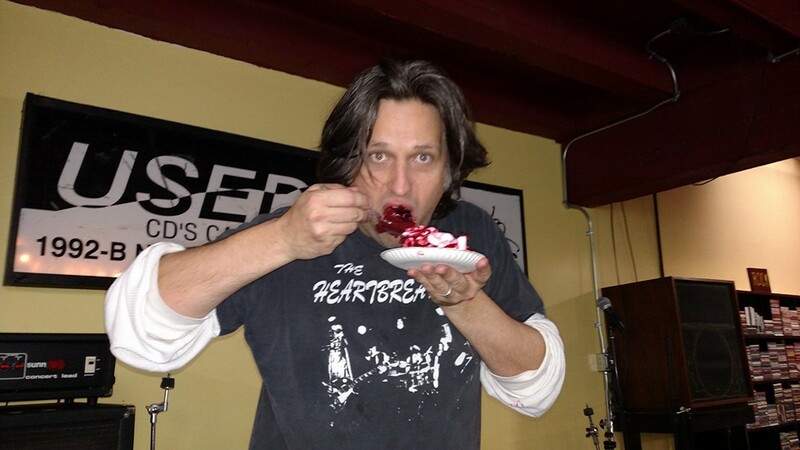 The Jenny Mae song “To Love” is a previously unreleased song and Jerry Wick’s “Love Death and Photosynthesis” has never been released on vinyl before. (It did appear on the Anyway Records CD comp “I Stayed Up all Night Listening To Records”.) Both songs have a melancholy sweetness to them that match the tone of the comic. Me: Why did you choose to do one Kickstarter for your entire 2018 slate versus multiple Kickstarters for the individual comics, magazines, records, etc.? Eppstein: That’s mostly just an economy of labor. Running 7 or 8 separate crowdfunders would require a lot of duplicated effort… New videos, new press releases/outreach, etc. To me, better to do all of that once than multiple times over the course of the year. I’m in the business of making comics, not running kickstarters, after all! Me: What is the number one reason why you think people should pledge your Kickstarter? Eppstein: You know, I avoid doing that kind of thing generically. Every aspiring artist is different, so what advice I would give them would be different. I’m more than happy to give individual creators advice and critiques if they ask! Me: Thanks for taking the time to give me the scoop about Nix Comics! If you’re reading this and interested in rocking out with Eppstein and the rest of the crew, check out their Kickstarter for the full 2018 slate of Nix Comics.